My new, new home – MeWe! It was just a little over a month ago that I was singing the praises of the social network Diaspora*, and those praises still stand. 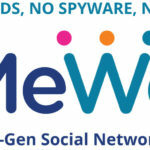 However as I had mentioned in that post, I had also signed up for an account on MeWe.